9 Secrets for getting Newborn to Sleep. Nothing brings more love, joy, excitement… and pure exhaustion than a newborn. We welcomed our little (big) baby boy just 5 weeks ago at 9 lbs 2 oz and 22 inches. We are just in love with him although Mission Get-Baby-To-Sleep is in full effect. 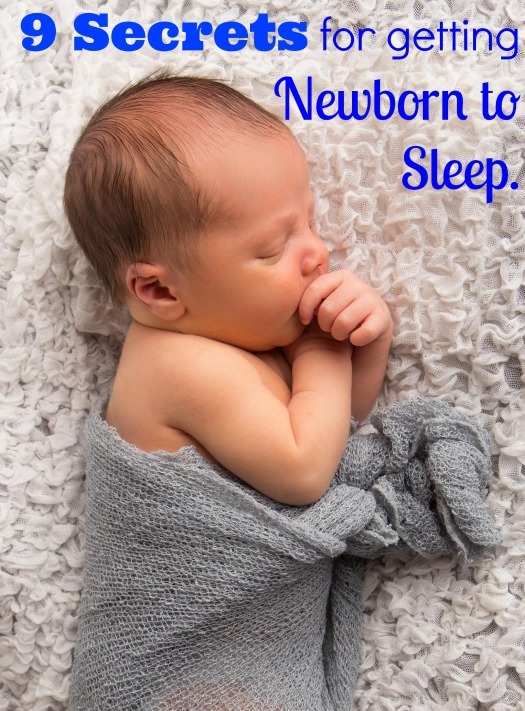 Although these tips are specifically for newborns, most of these sleeping tips can help any baby or young toddler sleep longer. Since you and I are watching the clock knowing our babies can wake at any minute, I’ll get right to my sleeping secrets. Because of these tips, our super-little-man last night slept from 10:30 pm to 5 am, ate, and then went back to bed until 8:30 am. These tips will help your baby sleep anywhere from 1 to 3 hours longer than they currently do. Every bit helps, right? Did you know that inside the womb is as loud as a vacuum? Have you noticed how vacuums, blow dryers, shhh-ing, and noise/vibration from the car are soothing to your baby? Your baby grew from conception to birth with sounds from mom’s lungs, heart, stomach, etc. White noise and not silence is very soothing to your newborn. White noise will save the day (especially night)! I now have two of these affordable white noise machines, one for my almost 3 year old daughter and newborn son. There are several sound options, but I think the actually ‘white noise’ option is most effective. Seriously… don’t wait on the white noise. Our babies are born not knowing day from night and night from day. We need to teach them! Where I live, the sun can set as late as 9:30 pm and rise as early as 5:00 am. Since I don’t want to start my day at 5:00 am, I keep the room as dark and soothing as possible until I know my baby is really up for the day. I also draw the curtains during nap time to darken the room. By using something to darken the windows when it’s sleep time, it helps the baby understand exactly that… it’s sleep time. My mom is a fabulous seamstress and sewed me some drapes with blackout on the back. If you don’t have that luxury, pinning up a dark sheet or blanket will do. Our little ones are obligate nose breathers meaning they mainly breath through their noses. If those cute buttons get congested, they’re not going to breath (or sleep) as well. Especially as winter approaches with all those nasty viruses, cold mist helps keep your baby’s nose moist, decreases inflammation in the nasal cavity, and can help prevent croup. I have one of these cold mist humidifiers in each of my children’s room. Some humidifiers give off too much vapor and can literally cause mold. This humidifier was one of the cheapest options and does not soak everything around it. Also, make sure you get cold mist and NOT warm mist. Pediatricians have cautioned that warm mist has the potential to burn your child and recommend always using a cold mist humidifier. “But he likes to have his hands and arms out and not be confined…” I’ve heard this from several parents and even been told this about my own baby! Your baby does not have control of his little arms. He’s going to revert back to the position he knew while in the womb which is having his hands up by his mouth. It’s almost like a reflex. He had to wiggle and maneuver in pretty tight quarters before being born and will eventually get out of a normal swaddle. With his arms out of the swaddle, his movements and little jerks will not keep him slumbering for very long. Also, swaddle blankets are not created equal. Aden + Anais Swaddle Blankets are the only way to go! They are light, stretchy, and keep great since you’ll be washing them thousands of times due to blowouts and spit up. You’ll want to purchase at least the package of 4. My husband is the swaddle master. He can get the swaddle way more snug than I can. Our baby usually sleeps longer when he does the swaddle. Here’s a short video on how to double swaddle. 5) Let your baby sleep in his own room or space. Unless you live in a one bedroom apartment or smaller, let your baby sleep in his own room or space such as a large, well-vented closet. Why? You will wake each other up! Newborns are squeaky when sleeping. They make adorable little noises and even cry sometimes while they sleep. Their little squeaks and peeps will wake you up all night long. You need to sleep as much as you can in order to handle all the responsibilities that are yours. On the other hand, your snores/noises, adjusting in bed, talking, and movements will wake them up. Your baby is also stimulated if they can smell mom. Whether or not you breast feed, babies associate mom’s smell with eating since moms are the one who dominantly feed baby. How long would you stay sleeping if there was freshly baked bacon in your room? Let your baby sleep unstimulated in his own room or space. 6) Stimulate and play 1 to 2 hours prior to your own bedtime. This rule is ONLY for babies 2 months and younger. Once they reach 2 months old, they need to go to bed much earlier than mom and dad. Healthy Sleeping Habits, Happy Child will give you a step-by-step according to their age once they are 2 months old. Okay…. back to my tip. My husband and I go to bed usually at 10:30 pm. At 9 pm, we make sure our baby is awake, not swaddled, lights are on, and we’re stimulating him. This is the only time I support waking a sleeping baby. Sometimes he’s happy and content while we talk and play with him. Other times, he’s crying and fussy so we rock, sing, nurse, and bounce to comfort but still do not let him sleep. We also do his baths right before bedtime. Around 10:15 pm, we take him to his room and begin our nightly bedtime routine which I’ll explain in #7. Also, make sure your baby is stimulated between naps during the day. Open the blinds, go on walks, run errands and talk, laugh, and sing with your baby. He needs to start learning there are distinct differences between day and night. 7) Establish consistent bedtime routine. You now have all the tools and can create a soothing, cool, and dark sleeping environment. Now it’s just down to the routine. You and your spouse obviously can establish your own, but here’s what my husband and I do. After stimulating for 1 to 2 hours prior to us going to bed, we take our baby in his room. We no longer talk, sing, or doing anything that we feel would stimulate our baby. We draw the curtains, turn off the bedroom light with minimal light coming from hallway or closet, turn on the white noise machine and humidifier, and begin getting him ready. After his diaper is changed and pajamas on, we swaddle him. I nurse him while gently rocking him. Again, with no talking, singing, or other action that would possibly stimulate him. Once I’m done nursing, I place him in his crib, turn off any remaining lights, and close the door. Viola! Now hurry and go to bed! When your baby wakes for night feedings, don’t undo all your hard work! Keep stimulation to an absolute minimum. You’ll have plenty of time to rock, sing, play, and enjoy your baby… just not in the middle of the night or both you and your baby will suffer from the lack of sleep. Do not barge into your baby’s room and flip on the lights! Turn on a hallway or closet light which shines minimal amount of light needed in order to care for your baby. Do not talk, sing, or stimulate other than with soft kisses (I can’t help myself). Change your baby’s diaper, re-swaddle, nurse/feed, return to crib (awake or asleep), turn off remaining light, and close the door. If you baby is awake still, give him the opportunity to sooth himself back to sleep. I’ve never been a let-them-cry-it-out mom. So if your baby starts to fuss longer than a few minutes, go back in and rock gently until he’s drowsy or asleep. 9) Use your secret weapon. There are going to be nights when nothing will seem to help soothe your baby back to sleep. That’s when you whip out your secret weapon… dad! Remember how moms equal food to newborns? Moms can sometimes be more stimulating than soothing. When dad relieves mom to rock, bounce, and comfort baby back to sleep, baby knows its business. Dads are more authoritative, soothing, and not a symbol of food. There have been a few nights where I have tried for over an hour to get my baby back to sleep. I go recruit my husband and within 10 minutes my baby boy is in a deep slumber. I’ve learned my lesson and now get my husband involved much quicker if my son doesn’t return quickly to sleep. We can do anything if we have sufficient enough sleep. Don’t get discouraged if you have a bad night. Be consistent with your routine and it will pay off! I also strongly suggest you purchasing Healthy Sleeping Habits, Happy Child. This is my sleeping Bible, and I refer to it often. It gives solutions, suggestions, and ideas on sleeping for each age group from newborn up to teenagers. Best of luck, my friends! Love your babies with everything you have… and then love them some more. Now, go get some sleep. 6 Ways to stop focusing on losing weight. We did the double swaddle with our first and it worked like a charm! totally agree with every piece of advice you give! Thanks, Lauren! Enjoy your new sweet baby. Thanks, Alexi! Yes… we start it from day one. Be consistent. It’s SO important to be consistent. There are going to be plenty of nights that make you want to give in and break one of your established rules. Be strong. My baby is now 9 months and goes to bed like a champ! He falls asleep on his own and only wakes up once for a quick feeding and returns to sleep until 8 am. It’s work BUT totally pays off. Make sure to get Healthy Sleeping Habits, Happy Child for after the two month mark. It starts to change quickly especially the need for an earlier bedtime. Thanks again! YAY! That’s a success, Ashleigh! Just keep being persistent. It’s all about doing it over and over until your baby learns. It’s totally worth it! My kids sleep great thanks to Healthy Sleeping Habits, Happy Child. I love everything you said! That last tip is hilarious! And I must say, foolproof too! And thanks a lot for posting that video on how to do a double swaddle. I’ve been struggling with it for days! I think my double swaddle’s a bit better now. My baby is really comfortable now whenever she sleeps. She rarely wakes up in the middle of the night and is not grumpy in the mornings! Thank you for taking the time to comment, Emily! My husband is seriously the double swaddle master. He can do it way better than I can. It does take some practice but works great miracles once our little bundles are nice and snug. Thanks again for commenting and sweet dreams for you and your sweet baby. Thank you for this! And thank you for saying that babies just need to be swaddled! It drives me crazy when people say their babies don’t like to be swaddled! Thanks again for the good advice! Thanks, Meagan! I’m a big fan of swaddling too. Dark room relaxing music… sets the mood. You rest while baby does. Some of your advice are wrong in so many levels! Firstly. Swaddle is not recommended anymore because they can cause hip problems to the infants. Also swaddling can increase the chance your baby will overheat. Secondly, never let your baby sleep in his own room or space at least not for the 1st year. It’s very important if you want to prevent SIDS. In Asia for example where it is the rule that the babies sleep in their parents room for the first year(s) there is not even a word to describe SIDS. In Western society on the other hand SIDS is very common. Also you say that you’re not a let-it-cry-it-out mom but apparently this is what you do even for a few minutes. For a newborn a few minutes means eternity. Never let your baby cry to sleep, or self sooth if that mean that most of the time it will be crying. Leaving a baby to cry evokes physiological responses that increase stress hormones. Please check your facts before you even propose a method and put somebody’s baby in harms way even though you didn’t mean to. Thank you for your opinion and comments, Angeliki! You are referring to a recent study on SIDS released within the last couple weeks about updating the SIDS protocol related to swaddling and sleeping alone. The SIDS protocol says “A separate but proximate sleeping environment is recommended such as a separate crib in the parent’s bedroom. Bed sharing during sleep is not recommended.” This does NOT say never let your child sleep in a separate room. There is not significant enough data to change their wording from ‘recommended’ to ‘mandatory’. I still recommend sleeping in separate rooms. AND apparently you did not read the whole article because I do not recommend letting a newborn cry-it-out. Thanks again for commenting.